Tens of thousands of UK tourists have been visiting Laos for years. Indeed when you travel in Laos, you will inevitably meet British tourists. However, it was only in 2012 that the UK reopened an embassy in Vientiane. 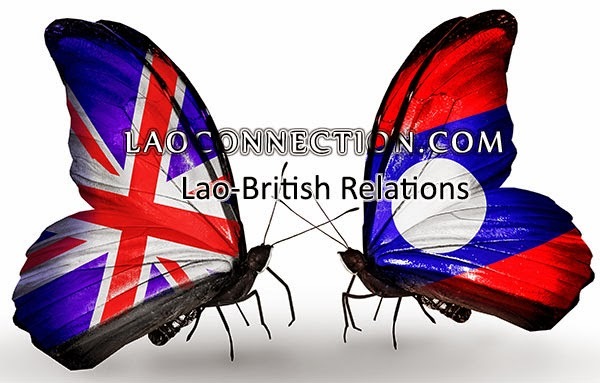 Here are some questions and answers on Lao-British relations. Does Britain have an embassy in Laos? Although relations began in 1955, it was in 1985 that the British Embassy to Laos closed its doors and relocated to Bangkok, Thailand. However on November 5 2012, after 27 years absence the British Embassy returned to Vientiane. Many British tourists visit Laos. Increased trade between the two nations. The West, in particular USA, UK and Canada, were pushing for increased engagement and relations with many of Asia's emerging economies. Many analysts believe this was in part to counter China's increasing influence in the Southeast Asian region. All 3 nations held high level visits to Laos beginning with Hilary Clinton, American Secretary of State, when she visited Laos on July 11 2012 and pleadged increase aid especially in UXO removal funding. That was followed by the new British Embassy re-opening in November 5 2012 and was presided over by Rt. Hon. William Hague MP, Secretary of State for Foreign and Commonwealth Affairs. Further, following that, John Baird, Canadian Minister of Foreign Affairs, visited Laos on October 15 2013 and pledged increased development aid and UXO removal funding support as well. British Trade Envoy. Lord David Puttnam was appointed by British Prime Minister David Cameron as trade envoy for Laos, Cambodia and Vietnam in November 2012. His assignment is to promote trade for UK businesses in the southeast Asian region. His most recent visit to Laos was March 1 2014. Additionally, with his background in film making, he also works to encourage and support the film industry through education and seminars on the topic while doing his visits. What is the address of the British Embassy in Laos? UK Tourists to Laos? In 2013, there were 41,741 tourists from the UK. Comparatively, there were 37,272 in 2010 and 31,352 in 2007. How does this compare to other tourists to Laos? In 2013 overall there were 212,566 European tourists to Laos out of 3,779,490 total tourists, which represents 5.6% of total tourists. Out of European tourists, the UK visitors ranked #2. They are preceded by France #1 with 52,411 (2013) and followed by Germany #3 with 29,250 (2013). How much trade between the 2 countries? In 2013, Britain exported 4,522,940£ worth of commodities to Laos and imported 4,386,089£.